Skills@Work is compiled and distributed by the Australian Government’s Department of Industry. All articles are submitted by the originating organisation and are published with their approval. If you would like to provide feedback on this newsletter, please email skillsatwork@industry.gov.au. The team at Skills@Work wishes you and yours a safe and relaxing festive season, and we look forward to seeing you all again in 2015. Our next edition is scheduled for distribution on 2 February 2015. If you would like to submit an article, please send it to skillsatwork@industry.gov.au by 16 January 2015. Victorian fitter and turner Melinda Lethbridge (above, centre) was named Australian Apprentice of the Year at the 2014 Australian Training Awards in Adelaide on Friday 21 November. Melinda was among 18 winners, including national training advocate Berwyn Clayton, who was awarded the Lifetime Achievement Award for her over 30 years of service to the vocational education and training (VET) sector. Minister for Industry, the Hon Ian Macfarlane MP, presented six award categories and provided a keynote address at the event. Melinda is pictured above with Patrick Janes (left), 2013 Australian Apprentice of the Year, and Minister Macfarlane (right). “These finalists demonstrate the tremendous opportunities provided by Australia’s vocational education and training system. The Australian Training Awards recognise the best in skills and training ranging from people just starting out with their careers, to others who are upgrading their skills and those who have made a career-long contribution to the sector,” Minister Macfarlane told over 700 guests attending the awards event. The event was held at the Adelaide Convention Centre, where guests were entertained by TAFE SA’s Adelaide College of the Arts Peforming Arts Programme. The Australian national anthem was sung by Vanessa Marousopoulos, a student from Music SA. Guests were further serenaded over entrée and main course by the 2011 South Australian Aboriginal and Torres Strait Islander Student of the Year, Ms Kristal West, and her singing partner—who form the duo ZK. The unique floral centrepieces were created by 2011 Vocational Student of the Year, floristry graduate Ms Vanessa Corbell, and guests also enjoyed the foyer exhibits featuring WorldSkills Australia national competition results. Held annually each November, the Australian Training Awards are the peak national awards for VET, recognising innovation and excellence in the training sector. Many of the awards are the culmination of the state and territory awards with winners from each state and territory competing in these nationals finals. Winners and finalists’ biographies are available on the Australian Training Awards website, while further information from the night is available from the Australian Training Awards Facebook page and Twitter account. Don’t miss the Faces of Excellence section which features the winners’ profiles! The 2015 direct entry categories of the Australian Training Awards are now open for entries. For further information please visit www.australiantrainingawards.gov.au or email australiantrainingawards@industry.gov.au. In September 2014, the Minister for Industry, the Hon Ian Macfarlane MP, announced that, at the end of the current contract period with Industry Skills Councils, the Australian Government would be moving to a more contestable model for the development and maintenance of training packages. The Government is considering new approaches to the development and maintenance of training packages which will be underpinned by the implementation of a contestability framework to ensure employers, the training sector, graduates and the public are provided with the best possible outcomes at the best possible price and quality. Stakeholder feedback is crucial to the design of the final model. The purpose of the Industry Engagement in Training Package Development Discussion Paper is to receive views and suggestions about contestable approaches to the development of training packages which guide industry-directed vocational education and training in Australia. The Government anticipates the introduction of a new contestable model from July 2015. You can access the Industry Engagement in Training Package Development – Towards a Contestable Model Discussion Paper online (PDF 642KB | DOCX 1100KB). To assist the Department of Industry in compiling and analysing the views of all stakeholders, those who would like to be involved are encouraged to provide their feedback through the Department of Industry’s Consultation Hub. The period for providing submissions will close on 24 December 2014. The department can be contacted via email or phone 13 38 73. The Minister for Industry, the Hon Ian Macfarlane MP, is undertaking a full review of training packages and accredited courses in the VET system. The Review of Training Packages and Accredited Courses Discussion Paper has been released to start the conversation with industry, employers, training providers and students about whether these training packages and accredited courses are meeting their needs and the needs of the Australian economy more generally. The discussion paper (PDF 389KB | DOCX 1286KB) seeks views on a range of possible approaches to addressing the issues that have been raised, and provides examples of alternative models from overseas for consideration. This feedback will help to inform the development of reform options for training packages and accredited courses for further public consultation in the first half of 2015. This discussion paper and other avenues for feedback are intended to be accessible for all stakeholders. Those who would like to be involved are encouraged to provide their feedback through the Department of Industry’s Consultation Hub. Feedback may also be provided through the VET Reform LinkedIn group. You can contact the department via email or phone 13 38 73. Consultations will be open until 18 February 2015. In addition, the department is looking to organise a series of webinars and face-to-face meetings to enable interested parties to provide feedback. Further information will be available soon and stakeholders will be notified. You can register online to receive VET Reform updates. Ministers at the Council of Australian Governments (COAG) Industry and Skills Council on 26 September 2014 agreed to new regulatory Standards for training providers and regulators. The new standards represent another important step towards an effective, risk-based regulatory system and introduce important changes that strengthen industry engagement, improve the quality of training and reduce the regulatory burden on training providers. The new standards also increase protections for students who want to undertake nationally recognised training and strengthen the requirements for the delivery of training and assessment qualifications – qualifications which underpin the overall quality of training delivered in the VET system. The new standards will come into effect from 1 January 2015 and transition arrangements will apply. publish information and guidance on the process of transitioning to the new standards. Regulating for Quality (PDF 77KB | DOCX 1144KB). What are the transition arrangements for the new standards? What is happening with the AQTF? Does the transition period delay the start of the USI initiative? From 1 July 2015, the Australian Apprenticeship Support Network (AASN) will deliver a new generation of support services for Australian Apprenticeships participants. The Australian Government is committed to building a high quality Australian Apprenticeships system which better supports apprentices and responds to the needs of employers and the economy. The AASN will make it easier for employers to recruit, train and retain apprentices and better support individuals in a proven earning and learning pathway, helping improve completion rates. The Network will offer services like mentoring and job matching for those apprentices who need greater support. The Network also will offer advice to employers and their prospective apprentices on appropriate Australian Apprenticeships arrangements. Tenders for the provision of support services through the AASN are now closed. The outcome of this process will be included in a future edition of Skills@Work. Current contracts with Australian Apprenticeships Centres expire on 30 June 2015. Further information about AASN is available on the VET Reform website. On 24 November 2014, the House of Representatives’ Standing Committee on Education and Employment released the report of its inquiry into TAFE and its operation, TAFE: An Australian asset. The inquiry’s terms of reference included considering the role that TAFE plays with regard to the development of skills in Australia’s economy, the provision of pathways for Australians to access employment and university education and the operation of a competitive training market. Public hearings were held in 2013 and 2014, allowing a wide range of witnesses to give evidence. The report contains seven recommendations, covering areas such as funding for TAFEs, reporting requirements and the addressing of concerns about the highly variable quality of training. The report can be viewed on the Committee’s website. In a major step towards making lost vocational documents and unnecessary training a thing of the past, the Unique Student Identifier (USI) Office opened its doors in mid-October 2014. Every year, many Australians build and sharpen their skills by undertaking nationally recognised training. Keeping accurate, accessible training records will allow government to target the skills needed by Australian industry. This is important for Australia’s businesses and future prosperity. In 2015, a USI will be needed for every student before a training organisation can issue a statement of attainment for any nationally recognised training. A USI is now a part of meeting VET data collection and reporting requirements. For students, having a USI ready at enrolment will save delays in getting your certificate or statement of attainment at the end of your training. So, the key is to become USI-ready as early as possible. With only a month to go before 1 January 2015, almost 100 000 USIs have been created! Students, if you’re doing any nationally recognised training next year, create your USI now! You’ll save yourself time by having it ready for enrolment day. You’ll also be on the way to having a lifetime record of all your training that you can access online anytime and anywhere. For training organisations, having the USI as part of your enrolment processes will put you ahead of the game. Many have already integrated USI into their systems. The USI Office’s resources can help you with this transition. You can see the USI support materials on the website. Employers delivering nationally recognised training in 2015 are also encouraged to get their staff to create their USI now. It will make your enrolments easier and your reporting also more streamlined. Contact the USI Office for further information. Industry, practitioners and researchers are invited to present at the 24th National Vocational Education and Training Research Conference No Frills, co-hosted with the University of Western Sydney and TAFE NSW's South Western Sydney and Western Sydney Institutes, on 6-8 July 2015 in Sydney. Submissions close 16 February 2015. Information and details on how to submit an abstract are available on NCVER's website. Six months after completing training, 77.6% of graduates are employed, with those employed full-time earning, on average, $57 400 per year, according to the latest Student outcomes 2014. Nearly three quarters (72.5%) of graduates employed after training gained at least one job-related benefit resulting from their training. Students' satisfaction with their training was also high, with 87.6% of graduates reporting they are satisfied with the overall quality of their training and 90.2% saying that they would recommend their training provider. With the release of Student outcomes 2014, NCVER has also updated the VET outcomes infographic. cancellation and withdrawals decreased 15.7% to 115 600. Comparison data over five years and data for states and territories are also available. Do you deliver foundation skills? Do you teach or help people develop their English language, literacy, numeracy or employability skills in Australia? As part of the National Foundation Skills Strategy Project, NCVER has been contracted to find out more about both paid and volunteer practitioners delivering foundation skills. Please help NCVER to find out more about the capacity of those delivering foundation skills. The online survey takes 10-20 minutes and is open until 19 December 2014. As part of the Department of Industry’s consolidation of skills content for consumers, the website of the former National Advisory for Tertiary Education, Skills and Employment (NATESE) will be decommissioned on 12 December. This will include the sub-sites of the former Standing Council on Tertiary Education, Skills and Employment (SCOTESE), National Skills Standards Council (NSSC), National VET Equity Advisory Council (NVEAC) and the Flexible Learning Advisory Group (FLAG). An automatic redirect will redirect users to the Department of Industry's website. Current key policy documents will be transitioned across to that website, in time for the 12 December 2014 closure of www.natese.gov.au. AQTF policies and user guides. Should you have any questions or concerns about the decommissioning of the NATESE website, please send an email to the Skills Communications team at the Department of Industry. WorldSkills Australia hosted the 2014 Skills Squad Training Camp at the Wollongong Surf Leisure Resort between 4-7 December. The training camp was the first opportunity for the members of the 2015 Skills Squad and their respective training managers, to meet and familiarise themselves with their teammates. The 2015 Skills Squad is an elite team consisting of the most talented tradespeople in the nation representing a range of different trade and skill professions. The squad are currently in training with the hope of securing themselves a position on the Australian team set to compete in their respective fields at the upcoming 43rd WorldSkills Competition being held in Sao Paulo, Brazil. Together with their training managers, members of the Skills Squad used their time to develop their training plans for the next six months. Aside from taking part in the planning and team bonding activities, the Skills Squad also worked together on a community project at Mt Keira Lookout on Friday morning designed to give the iconic local attraction a face-lift. The community project saw all 29 members of the Skills Squad and their training managers work together to utilise their impressive skills to conduct some general maintenance at Mt Keira Lookout which included a fresh coat of paint on the fencing, clearing vegetation, installing bench seats and repairing some dilapidated walling to name only a few. Thanks to the combined efforts of WorldSkills Australia, Wollongong City Council, TAFE NSW Illawarra Campus and the Rotary Club in Wollongong, the picturesque location has now been revamped for local tourists and members of the community to enjoy. An updated Licence Recognition website was launched on 9 December 2014. The website provides easy-to-access information about how an occupational licence or registration is recognised in another state or territory. The website allows licensed tradespeople, jurisdictional licensing authorities and employers to search for an agreed equivalent licence or registration in another state or territory. The licence equivalency mappings are based on ministerial declarations. The declarations are currently being reviewed and updated, and any changes will be shown on the website. To find out more, please visit www.licencerecognition.gov.au. Access your complimentary copy of Staying Connected in VET eZine! Velg Training has launched the second edition of its quarterly online magazine, Staying Connected in VET eZine, a publication to educate, inspire and empower Australia’s VET sector. offers from advertisers including interactive links to their digital channels! The publication is hosted online via Issuu, where you can download, email or share via your social media networks. The next edition will be published on 12 February 2015. Please see Velg’s website for details of deadlines for advertising and editorial contributions. For more information and to access your complimentary copy, please visit Velg’s VET e-Zine website. Consultation is open for the Community Services and Health Training Packages. The deadline for feedback is 12 December 2014. Please visit the public consultation portal to provide feedback. CPSISC, in collaboration with Lend Lease and TAFE NSW, has been presented with the 2014 Premier’s Partnership Award for the Barangaroo Skills Exchange (BSX). Run every year, the Premier’s Awards shine a light on the best projects, policies and individuals in the NSW public sector. Barangaroo aims to be carbon neutral and water positive, whilst generating net zero waste and enhancing the wellbeing of the community. Achieving this requires the development of a green-skilled, onsite workforce, with experience in renewable energy, energy efficiency, sustainable water systems, sustainable materials, green buildings, and waste and recycling. BSX was established in 2012 through a partnership with TAFE NSW, Lend Lease and CPSISC to coordinate, deliver and report on all aspects of skilling, training and research. BSX was a finalist for the Industry Collaboration Award at the 2014 Australian Training Awards. 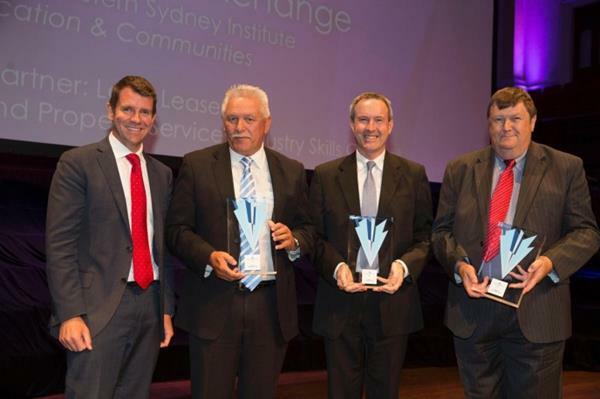 Image (L-R): Mike Baird MP, Premier of NSW, Ron Wright, TAFE NSW, Andrew Wilson, Lend Lease and Mark Pincott, CPSISC. providing workforce planning and development assistance in order to upskill the workforce, address skills needs and improve productivity (workforce development audits and half day workshops available at no cost to you!). To find out more, please click on the ‘Public Sector’ tab on GSA's website or email Rebecca to find out how GSA can assist your public sector organisation. Stakeholders of the Public Safety Training Package are invited to provide feedback on draft material for future endorsement into the Training Package. Feedback will close on 31 December 2014. This is the first group of material from the Public Safety Training Package reviewed to meet the requirements of the new standards for training packages. Aquatic rescue skill sets (x 6). To review the draft PUA material, please visit GSA's website. GSA is undertaking a national study, the Water Occupation Census, to count the number of employees in 28 water occupations defined in the Australian Water Occupations Framework (AWOF). This study is being conducted in collaboration with the WSAA, People and Capability Committee, VicWater, QldWater and the NSW Water Directorate. The purpose of the study is to establish quantitative data on the number of people working in water-specific occupations. Currently, the water industry is under-represented or invisible to the ABS and Government as they are not adequately represented in the Australian and New Zealand Standard Classification of Occupations (ANZSCO). Responses will be collated and only summarised data will be used for reporting. GSA will collate and communicate the results to the water industry in early 2015. GSA is counting the VET roles that use qualifications in the National Water Training Package (NWP) and are defined in the AWOF. GSA invites water and local government organisations to participate. Please email Sue Peisley to determine if your organisation has completed the census. For more information on any of the items above, please call GSA on 08 8100 7400 or visit the website. IBSA is pleased to announce the release of the updated learning and assessment materials for BSBADM502B Manage meetings… more. Music Training Package review – IBSA needs your feedback! The Music Training Package Review has IBSA consulting widely with music industry representatives to ensure all qualifications and skill sets continue to meet the needs of industry and practitioners. Five qualifications have been developed, and IBSA is now looking for your feedback… more. need for additional development and continuous improvement to meet identified industry skills requirements. Editing / QA / TGA transfer. Review of niche trades and technician qualifications to commence January / February 2015. Face to face consultation and reference group meetings – January / February 2015. Consultation and development to be undertaken January-March 2015. Consultation and development to commence January 2015. For further information, please email Barbara Wallace, MSA Training Products Manager. Feedback is now open for the validation draft of the SIS Cross-Sector Training Package components. To review and provide feedback on the content, please visit SSA’s Feedback Register and access the project titled SIS Cross-Sector Training Package Components. Feedback on the validation draft closes 7 January 2015. If you would like more information about the Training Package review, please visit SSA’s project webpage. You can also keep up to date with the review, and with SSA's activities, by registering for news alerts and the monthly eNewsletter. We are pleased to introduce you all to the winners at the 2014 Australian Training Awards! The Australian Government's Department of Education will be conducting training sessions for approved VET FEE-HELP providers throughout 2015. This training is suitable for recently approved or existing VET FEE-HELP providers that wish to refresh their knowledge. For more details and schedules of dates and venues please visit the Department of Education's website. VETnetwork Australia is running a series of professional learning events in March 2015. Titled A Focus on VET Literacy and Numeracy, these events aim to develop a better understanding of language, literacy and numeracy (LLN) for VET teachers and trainers. These dynamic events will feature keynote presentations from David Tout, Senior Research Fellow and Manager, Vocational Adult and Workplace Education, Australian Council for Education Research (ACER) and Ros Bauer, 2013 Excellence in Language, Literacy and Numeracy Practice Award, Australian Training Awards. Hints and tips about teaching L&N. For more information, including details on how to register, please visit VETnetwork's website. The Australian Workplace Practitioners’ Network (AWPN) invites you to attend the 2015 AWPN National Conference to be held at the Jasper Hotel in Melbourne. The theme for the conference is Refresh Rebrand Re-engage: Foundation Skills at Work. The conference will focus on how policy makers, VET professionals and industry can work together to build the highly skilled and innovative workforce needed to compete in global markets. What are the new Australian Government policies and programs and how do they work? How can we work together to ensure industry has the skilled and productive workforce it needs? How can we best support an industry-led, sophisticated and flexible VET system? Foundation skills strengthening is a shared responsibility, whether you are an experienced LLN specialist, a recently qualified vocational trainer or a workplace supervisor. For further information and registration, please visit the conference website. Visit the NSW State Training Services website to view upcoming events and professional development for New South Wales training providers in 2014. On behalf of the Australian WELL Practitioners Network/Foundation Skills network, IBSA has compiled into a single repository all the free foundation skills resources developed by each of the Industry Skills Councils to support VET practitioners. IBSA hopes you find it useful, and looks forward to receiving feedback. Please visit the website for more information and to access the resources. New videos have been released! Ideas That Work has released seven new language, literacy and numeracy (LLN) videos for the What Works for LLN training and professional development video library. These new videos contain practical LLN tips and good practice examples to help build vocational trainers’ and assessors’ capacity to support learners with LLN needs. There are now 25 What Works videos available to view or download for free from the new What Works for LLN website. Introduction to workplace LLN series (new videos coming in 2014). • learners undertaking qualifications such as TAE40110 Certificate IV in Training and Assessment. You can go straight to the What Works library or target your video search by selecting one of the search categories on the home page. The 25 videos can be downloaded individually or you can select the ‘Download entire series’ button to download all the videos in that series. These videos were funded by the Australian Government’s Department of Industry. To view or download a copy of these free What Works for LLN resources, please visit the website. Access ready-made content through VET Commons today! Search VET Commons, preview resources and add them to your course. What’s so good about VET Commons? Save even more with an annual subscription. The Cengage team prides itself on speaking the same language as teachers, making content easy for you and your students to understand. Pick and choose what you need or sign up for an annual subscription and save on copyright licences. Cengage Learning is a leading educational content, software and services company for the academic, professional and library markets worldwide. Cengage develops quality content specifically for your courses and especially for your sector. Access its content today through the VET Commons ready-made plugin. Stay in touch with current research, policy and practice across a broad range of areas affecting the VET sector in Australia and internationally. Produced by the National Centre for Vocational Education Research (NCVER) and funded by the Commonwealth, state and territory governments, VOCEDplus is a free online resource offering international coverage of issues as well as an Australian focus. It currently holds over 57,000 entries, many providing instant access to full text via your desktop, with around 400 new titles added each month. Where possible, NCVER will supply items as requested according to its Conditions of Use. Subscribe to new titles or Twitter on the home page for automated notifications. Subscribe to specific RSS feeds wherever you see the ‘Subscribe’ symbol above. Click on your browser’s RSS icon and subscribe to the feed. Expert reference service – for details visit the Client Service Charter or Ask a Librarian. Citation tool – My Selection acts like a shopping cart, select records from search results or full record pages, email or save records in formats (e.g. author-date citation modelled on the Harvard style; tagged format for import into EndNote). special collections, e.g. National landmark reports and Pathways support for practitioners. To find out more, visit VOCEDplus. a professional development resource comprising a facilitator guide to outline a background to foundation skills initiatives, strategies to address foundation skills issues in a range of work and training contexts and industry-specific foundation skills data on the foundation skills demands of units of competency. Please visit the website to download the resources or email a request for a printed copy. Government Skills Australia (GSA) has developed Meeting the Foundation Skills Demands of Training and Work as a professional development resource to raise awareness of foundation skills issues amongst workers and learners in the Australian context. Its primary aim is to support the key messages outlined in a range of foundation skills documents developed by GSA to support the newly endorsed foundation skills training package. The guide is accompanied by short videos that build awareness of the language, literacy and numeracy or ‘core’ skill demands of tasks embedded in work roles within the government and community safety industries. Vocational course developers, trainers and assessors are provided with information about how to identify the foundation skills embedded in both work and training contexts. They are easily disguised in a variety of tasks and roles so often go unnoticed. It also offers some strategies to develop an understanding of what foundation skills are, where they can be found and how they can be addressed in practical terms. You can view and download the resource from GSA's website. Teachers and trainers who are new to e-learning, or those already using e-learning content developed through the National VET E-learning Strategy, are set to benefit from the newly launched National VET Content website. This new site brings together thousands of freely available learning objects from the following national collections: Flexible Learning Toolboxes, Generic Skills, E-learning Innovations, Industry Integration of E-learning, and the National Digital Learning Resources Network. You can find out more by visiting the Flexible Learning website. Manufacturing Skills Australia (MSA) – have you seen the new literacy and numeracy resources? MSA’s Putting the Jigsaw Together numeracy resources and the Making the Connections workshop for vocational education and training (VET) trainers have proved to be extremely popular. Over 900 RTOs, individual trainers and educators nationally have accessed the resources since their release. Putting the Jigsaw Together is designed as a series of tool kits to support VET trainers with practical strategies to assist apprentices to develop their numeracy skills. Making the Connections is a two day workshop providing the key concepts of language, literacy and numeracy and foundation skills in VET training. Identifying core skills in a unit of competency and working with the Australian Core Skills Framework is included in the resource. These resources are now available for FREE download at MSA's website. For further information contact Kathy Higgs, MSA Foundation Skills Project Officer, on 02 9955 5500 or via email. Are you looking for new ways to engage with adult learners? Perhaps you are interested in finding out more about Australia’s adult community education (ACE) sector? If so, the Tap Into Learning Today (TILT) website is for you. The TILT website is Australia’s national communication strategy for ACE. TILT provides information and resources for the ACE sector. It enables ACE providers to promote their services and engage adult learners in their communities. Through the website, providers can find resources and strategies to access potential learners, including templates for promotional materials and information about funding and professional development opportunities. TILT also provides an avenue for individuals to find learning opportunities in areas such as community engagement and foundation skills. Links to key contacts, and the ability to locate ACE providers in their local areas are provided to direct individuals to the support they need. The TILT Community Calendar is a great way to find out about ACE-related events. While you are there, check out some of the case studies and success stories of ACE projects in Australia through AceTV. To find out more about TILT please visit the website. building knowledge of numeracy in the workplace context. This resource has been developed in response to the NCVER report Seeking the N in LLN. This report found that there may be a need to increase the capacity of the VET workforce to meet the numeracy skills needs of existing workers. six ‘snapshots’ exploring different workplace numeracy skills. raising awareness of workplace numeracy in the VET sector. Numeracy is an important core skill. All practitioners must be up to date and confident in their own numeracy skills, their numeracy training skills and their understanding of typical workplace numeracy activities. are not sure if their numeracy skills are sufficient to complete the Graduate Certificate in Adult Language, Literacy and Numeracy Practice. These resources were developed by Oggi Consulting and funded by the Australian Government. For more information on these resources, email Tina Berghella at Oggi Consulting. CPSISC received funding under the Australian Government’s Clean Energy and Other Skills Package. This Commonwealth funding has allowed CPSISC to undertake a series of interlinked projects to support VET and other higher education providers to build the skills, knowledge and capability to deliver clean energy services, products and advice to the Australian community and businesses. The project has seen the development of a suite of resources to support the professional development needs of RTOs. The free downloadable resources also support the delivery and assessment of four new ‘Energy Efficiency’ units of competency recently endorsed and included in the CPC08 (Version 9) Construction, Plumbing and Services training package and the CPP07 (Version 14) Property Services training package. Energy efficiency - RTO professional development kit (contains a professional development kit and PowerPoint presentation for RTOs). To download a copy of these free resources, please visit CPSISC's website. Australian Apprenticeships - provides quick and easy access to information regarding Australian Apprenticeships, including Australian Apprenticeships programs, employer incentives and support for apprentices during their apprenticeships. Australian Apprenticeships and Traineeships Information Service and Australian Apprenticeships Pathways - provide apprenticeships and traineeships information and resources. Australian Training Awards - the peak, national awards for the vocational education and training sector, recognising individuals, businesses and registered training organisations for their contribution to skilling Australia. business.gov.au - offers businesses simple, practical and convenient access to all the government information, programmes and services they need to make running their business and skilling their employees easier. Industry Skills Councils - bringing together industry, educators and governments, and uniting them on a common industry-led agenda for action on skills and workforce development. LiteracyNet - information about Australian adult literacy activities and links to a range of additional program, professional development, resource and research sites (including training programs). MySkills.gov.au - provides information about vocational education and training to future and current students, jobseekers and employers to help them make informed choices about training. National Centre for Vocational Education Research (NCVER) - a not for profit company responsible for collecting, managing, analysing, evaluating and communicating research statistics about vocational education and training. National Skills Week - provides a platform to highlight the opportunities and career pathways available through vocational education and training. StudyAssist.gov.au - one stop shop for information on government assistance while studying. Students can use the website to determine their options for financing their tertiary study. The course search function allows students to look for courses offered by approved VET FEE-HELP providers. training.gov.au - the official national register of information on training packages, qualifications, courses, units of competency and registered training organisations, developed for experienced training sector users. WorldSkills Australia - working to promote and build a skills culture by inspiring young people, celebrating skills excellence and providing opportunities to showcase trade and skill talent through competitions held on a regional, national and international level. If you would like to provide feedback, supply an article for inclusion in the next edition or join our list of subscribers, please email skillsatwork@industry.gov.au. The next edition will be published in February 2015. Submissions are due by 16 January 2015.